« Quick Healthy Snack of the Day! So what’s in it? 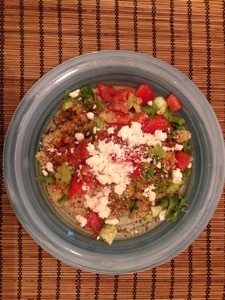 Quinoa, cucumbers, tomatoes, fresh parsley, feta cheese, lemon or lime juice, lite salt, cayenne pepper and basil. I also like to some times add chicken to mix it up. Mix and serve warm or at room temperature. This dish is very quick and simple to make. Bon appétit!